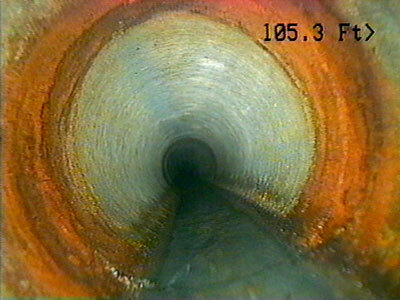 Some sewer blockages require more than a flush with the pressure jetter and there is no better way of analising a difficult obstruction than with the computerised sewer camera. Working in tandem with a sophisticated pipe locator, the camera will identify exactly what and where your blockage is. Extremely useful for detecting tree root intrusions as well as delapidated, sunken or damaged pipes. Video recording is also an option should you wish to keep this top quality colour footage for future referall. Once the exact nature of the problem is determined, The Drainer can then proceed with the sewer clearing process or if need be unearth and repair damaged drains. For peace of mind and a no-nonsense approach, the sewer camera is a recommended option.